Registered trademark Farm Tubs Planters and Do It Yourself Self-Watering Growing System Kits are custom-built to meet your home and garden needs. The Farm Tub Growing System Kits are included in Farm Tub Planters or can be customized to fit any planter, container or stock tank. The System utilizes a water reservoir and capillary wick system that waters from beneath, and is easy to manage and self-irrigates once established. For effectiveness, the system requires the use of a high-grade potting soil, such as Black Gold Natural and Organic Potting Soil. The Farm Tub Systems are great for homes, greenhouses, decks, patios, gardens, parks, schools, senior living and community urban gardens. They are perfect for container gardening and growing your own food in an efficient, water-saving manner. Farm Tub Planters: Decorative, artisan Farm Tub Planters are perfect for creating that showpiece garden in your home. With a galvanized steel basin and decorative wood wrap, Farm Tub Planters integrate the benefits of both metal and wood planters. The timeless designs are built from durable materials. Recycled, reclaimed and sustainably forested woods are used for the veneers. 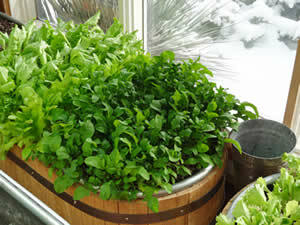 Farm Tubs can be fitted with grow lights for indoor use in greenhouses and sunrooms. Farm Tub Kits: Farm Tub DIY Self-Watering Kits are sold separately to convert any planter, container or stock tank to be self-watering. Farm Tub also offers custom retrofitting services on demand. About: Farm Tub LLC is a small, Colorado company dedicated to the fresh, organic food movement by making it easier for people to grow their own food at home. As avid organic gardeners and foodies, the landscape architect and food publicity owners are not only passionate about the food they eat, but the joys of growing your own. They first created the Farm Tub System for planters in their own small greenhouse because they wanted to grow greens, tomatoes and herbs year-round. After years of experimentation and bountiful harvests, friends started asking for Farm Tub Planters of their own. From those beginnings a company was born.